Jonestown: Terror in the Jungle, from Sundance TV, speeds for Guyana as if it suspects we’re impatient. Shan Nicholson’s four-part docuseries, coinciding with the 40th anniversary of the Jonestown massacre, introduces Rev. Jim Jones’ fantasies of nuclear apocalypse 20 minutes into the first episode, when the members of his Peoples Temple decamp for California. At 28 minutes, we’re on to the Temple’s nationwide bus trips, designed to recruit the downtrodden in Los Angeles and Seattle, Houston and Detroit; at 35, we reach Jones’ abuse of amphetamines (to get through the long day) and tranquilizers (to come down from it); by the time the credits roll, the episode’s raised the related specters of propaganda, conspiracies, paranoia, and fear-mongering. Such facts of the case—and far, far worse still to come—are essential, of course, to understanding the tragedy at Jonestown, the remote South American settlement where more than 900 people, including more than 300 children, died from cyanide poisoning on November 18, 1978, in a mass murder-suicide so unimaginable it we invented a new idiomatic expression in order to assimilate it. To “drink the Kool-Aid,” as the saying goes, is to submit willingly to one’s own destruction, the ultimate erasure of the self: It is death by absorption, the part subsumed by the whole. As Terror in the Jungle is at pains to point out, the phrase is inaccurate and needlessly cruel. It was Flavor-Aid, not Kool-Aid, that masked the cyanide’s bitterness, and for many of the dead, there was nothing “willing” about its ingestion: In addition to the hundreds of dead minors, dozens of adult victims were forcibly injected with the poison, and those who drank it of their own volition did so surrounded by guards. 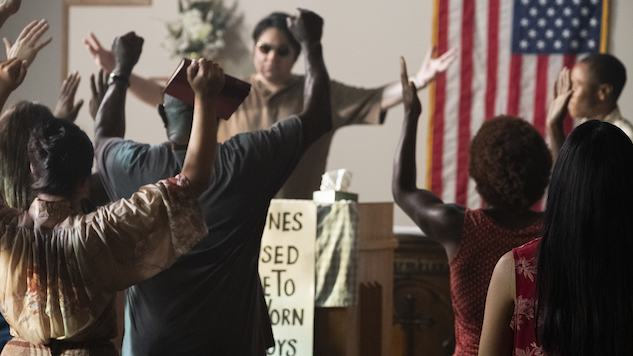 Still, its tenacious life—and, for that matter, the continuing use of Jones, Peoples Temple, and Jonestown as objective correlatives of the “cult,” writ large—is a potent example of pop culture’s meager understanding of the phenomenon, one SundanceTV’s disappointing docuseries ultimately reflects. From Cielo Drive to Waco, Tex., from Peoples Temple to Heaven’s Gate, we know of, even obsess over, the dangers of cults, their charismatic leaders and dramatic immolations. It’s much less common to focus on the frightening solace of cults, the hopeful moment of their formation. Telling, then, that Nicholson’s version, though adapted from executive producer Jeff Guinn’s outstanding The Road to Jonestown: Jim Jones and Peoples Temple, should abridge Guinn’s discussion of Jones’ Indiana origins and the Temple’s California expansion in favor of the more well-known details of life and death at Jonestown. Coupled with a number of questionable aesthetic choices—the ceaselessly foreboding score, for one, or the shadowy, increasingly mortifying re-enactments of key events—the result, as advertised by the title, is an unsatisfying portrait of “terror” without antecedent, only fitfully interested in the Temple’s appeal. Lost in the glare of Jones’ rock-star persona, with his sunglasses, coiffed hair, and adoring followers, is his application of old-fashioned machine politics in Indianapolis in the 1950s, by which he won practical victories for his mostly black, working-class congregants; his public commitment to racial integration and socialism at a time, in the 1960s, when both ideas had few vocal supporters in the halls of power; even the broader attraction of communal life, work, and worship in the 1970s, at a moment it seemed the American dream was coming apart. That Jones manipulated these factors to feed his megalomania, and later turned to outright physical, sexual, and psychological abuse (often glossed as “brainwashing”) to maintain his hold on the Temple, is not in dispute—nor is it, on a subject that has inspired at least five prior film/TV treatments, as instructive as Terror in the Jungle supposes. The problem with cults, at least as they’re depicted (or imagined) in popular culture, is this very tension, in which the urge to underscore the most sensational details is at cross-purposes with understanding cult members’ very ordinary, often sympathetic motives for joining. At the length of a film, from Rosemary’s Baby to The Invitation, leaning into the former can generate the terror Nicholson promises, but at four, five, six hours (or more), it’s the latter, much harder to dramatize, that becomes most significant: Fiction or non-, limited or ongoing, the cult requires character development beyond the figure at its center, and vanishingly few of its recent iterations—including Aquarius, The Path, American Horror Story, and Waco—manage to do this successfully. (Even my beloved The Leftovers was at its best, in Seasons Two and Three, when its post-doomsday cult, the Guilty Remnant, moved to the margins of the narrative.) Demagogues can only hold one rapt for so long: Dear Leader may profess to be immortal, but in the end—and there is always an end—he is necessarily, wretchedly human. If Terror in the Jungle races through its rich source material to reach that (admittedly engrossing) end—climaxing with the assassination of Congressman Leo Ryan and four others on an airstrip near the encampment, and the subsequent mass death at Jonestown itself—Netflix’s Wild Wild Country, directed by Chapman and Maclain Way, slows almost to stopping, and finds no real end at all. The docuseries’ recounting of the establishment and abandonment of Rajneeshpuram, formed by devotees of the Indian guru Bhagwan Shree Rajneesh in remote north-central Oregon in the 1980s, squanders an intriguing tale of the difference (or lack thereof) between “community” and “cult” on an interminable, punishingly detailed portrait of the guru’s fiery fixer, mouthpiece, defender, and possibly usurper, Ma Anand Sheela. It’s no surprise: The lightning rod for the conflict that emerges between the Rajneeshee, numbering in the thousands, and the neighboring village of Antelope (pop. 40), Sheela is, as Slate’s Inkoo Kang writes, deliciously combative, willing to rage against the real and perceived injustices facing the Rajneesh on The Merv Show, Nightline, Crossfire, and more. She is also, it’s alleged, a dangerous criminal, spiking beer with Haldol and salad bars with salmonella, and, as Rajneesh himself accused her, making off with millions. As with Terror in the Jungle’s lopsided structure, though, Wild Wild Country’s prevailing interest in Sheela crowds out more fascinating issues. The pitched battle between the (multicultural) Rajneeshee and the (predominantly white) residents of Antelope, Wasco County, and Oregon state—which included a number of civil and voting rights abuses on the part of authorities, in addition to the more general “prejudice”—becomes an afterthought, and in the process, the docuseries loses any sense that its tale has broader implications. And, to echo Kang, seven or so hours of material offers no firm understanding of the Rajneeshee’s beliefs. There’s an apparent “free love” element, a violent release of energy known as “dynamic mediation,” a requirement to wear maroons and purples, even an embrace of free-market capitalism, but despite extensive interviews with Sheela and fellow members Jane Stork and Philip Toelkes, Wild Wild Country cannot suggest a single structuring principle, other than a vague sense of “belonging,” that might draw thousands of followers from across the globe to to an absent guru and his churlish lieutenant. In this, Wild Wild Country might be the ultimate warning against turning cults into television, which is that such artifacts often mimic the relationship between leader and member: so mesmerized by the figure at the center of the story that the depth of field disappears, the perspective narrowing to a treacherous pinprick. That neither Terror in the Jungle nor Wild Wild Country manages to elaborate an understanding of Peoples Temple or Rajneeshpuram that runs deeper than this hoary old trope ultimately hobbles the series: The former returns to familiar ground, while the latter relates a mostly forgotten tale but neglects to suggest the stakes of doing so. Arguably, cults fascinate us because they’re common, not because they’re rare. The millenarian tradition that fuels more modern forms of apocalypticism runs in our very marrow, and through evangelical voters has emerged as one of the most powerful political forces in the nation in the last half century. The yearning for place, and purpose, that stirs such commitment in the rank-and-file is one of the essential elements of the human condition. Rapacious leaders promising their followers heaven and earth in return for unflinching, uncritical allegiance are one of the few true constants of American life, from “Pitchfork” Ben Tillman to Donald J. Trump. What becomes clear reading The Road to Jonestown, or listening to Karina Longworth’s indispensable podcast You Must Remember This on “Charles Manson’s Hollywood,” is that cults only leave the mainstream at the moment of their destruction. Jones curried favor with the likes of George Moscone, Angela Davis, Rosalynn Carter; Manson and his “family” were part of the same scene as the Beach Boys, Kenneth Anger, and Doris Day. Cults aren’t on the margins of American culture, they’re just beyond the footlights—and series that center Dear Leader, that approach the subject as a lurid exception, miss the irresistible question at the heart of our interest: Could I have been seduced and ensnared by these organizations, in the right circumstances? Could it have happened to me? In fact, it’s Longworth’s 12-part examination of Manson and his historical moment that presents another path, in which Manson is the main character, but not the only substantive one, and through which it finally becomes possible to see the Manson murders as contingent on time and place as well as persona, an expression of currents larger than any one man. To frame these stories otherwise is to grant cult leaders the very larger-than-life importance they so desperately sought, and so vociferously claimed. As such, Longworth includes a detailed account of the murders in the first episode of “Charles Manson’s Hollywood,” as if to dispense with, rather than milk, its grisly titillations, and offers, in her introduction, a reading of Manson as more than a representative of the end of the Sixties. In noting that his life before Hollywood exposed the limits of the American dream, and that the paranoia infusing pop culture in the aftermath of the murders helped invent the Seventies, Longworth succeeds where Terror in the Jungle and Wild Wild Country fail: She recognizes that cults fascinate us most of all—and remain stories worth trying to tell, and tell better—because they have a context, and because that context is necessarily, wretchedly our own. Jonestown: Terror in the Jungle premieres Saturday, Nov. 17 at 9 p.m. on SundanceTV. Wild Wild Country is now streaming on Netflix. Listen to the first episode of “Charles Manson’s Hollywood,” from You Must Remember This, here.